Title: From Honor Guard to Grand Marshal; Mayor George Doll once served in honor guard at Arlington National Cemetery. He brought pomp and ceremony Monday to Northport Memorial Day parade. Before he was mayor of Northport, before he was a lobsterman, George Doll served in the honor guard at Arlington National Cemetery. Just a lanky kid from the Long Island suburbs, Doll landed the prestigious duty in 1965, just as the war in Vietnam started to intensify. Doll was drafted and served 18 months with the 3rd Infantry Division guarding Washington. 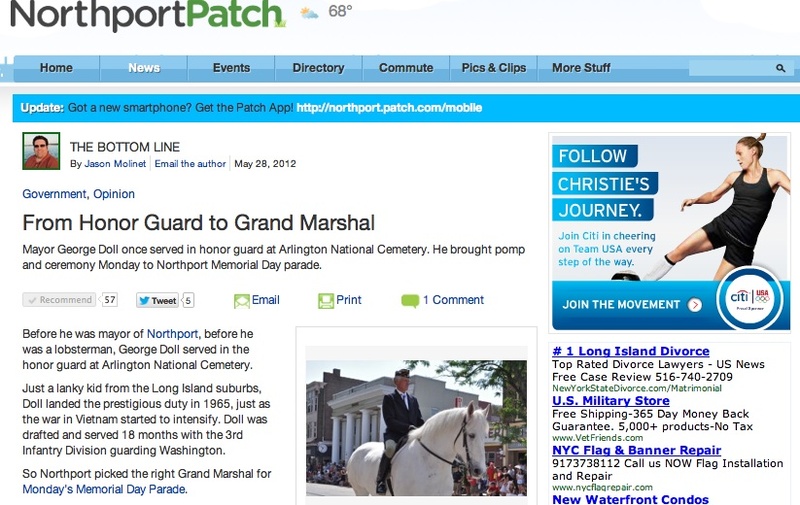 So Northport picked the right Grand Marshal for Monday’s Memorial Day Parade. Doll was a member of the Army drill team in his youth, in part because of his height. As he led the parade down Main Street on Monday – astride a white-haired draft horse and representing the American Legion – Doll appeared downright imposing. He takes his current role deadly serious. Kraft was killed in action in the An Lao Valley on April 8, 1967. He was interred at Arlington. Doll’s tie, featuring Texas state flag, is a tribute to another fallen comrade. It was a gift from a buddy who died in Vietnam. Doll has been part of the Northport parade since he was a child watching the procession march by. There was a time – before Doll – when the annual Memorial Day ceremony paraded down an unpaved Main Street. Through the decades, it’s an event that binds the Village and one generation to another. The formal pomp of the day struck the proper red, white and blue chord. Maybe some future mayor of Northport watched Monday’s ceremony in awe sitting on the street curb – or a stroller – as Doll rode past. It was an inspiring morning. The dead were honored. Our living war heroes were saluted. 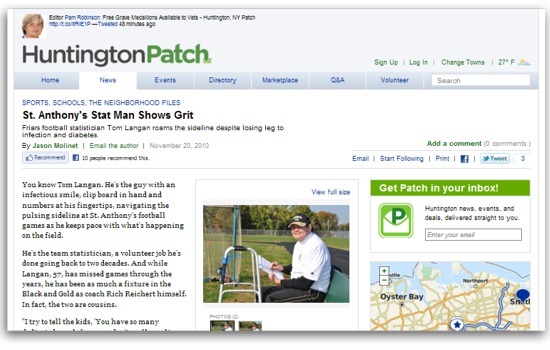 It was a day where you were proud to live in Northport. 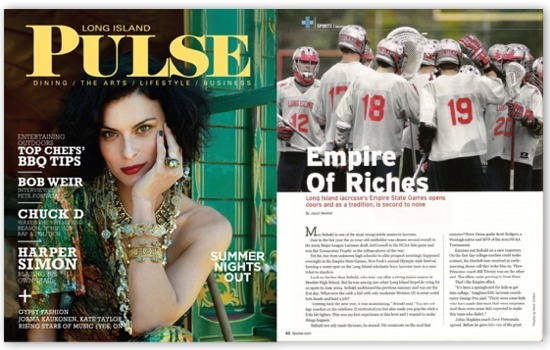 About this column: Regional Editor Jason Molinet weighs in on the people and issues which make Long Island great. Patch.com regional editor Jason Molinet took part in a panel on sports reporting in the Newsday auditorium. The event was sponsored by the Press Club of Long Island. Panelists included Mark Herrmann, Newsday sports writer; Amy McGorry; News 12 Westchester; and Jason Molinet, Patch.com / longtime sports writer. The moderator was Pat Calabria of Farmingdale State College and a former Newsday sports writer. In the mean time, he decided to build an 8-foot skiff in his garage, one plank at a time. Nicknamed “Cabin Boy,” the small boat came together rib by rib and gave rise to his blog. The Empire State Games are a rite of passage for New York athletes. The annual summertime Olympic-style festival has churned out fond memories and fine athletes since 1978. Famous alums include Mike Tyson and Kenny Anderson. But when New York State Parks commissioner Carol Ash suspended the Games in April 2009, she pointed toward a problem which is sure to dog the event for the foreseeable future – money. “Moving forward, it is difficult to foresee that the state, alone, will be in the position to continue to fund 90 percent of the cost of the overall program, which totals more than $3 million annually,” Ash said last year of a program which includes Summer and Winter Games as well as Games For The Physically Challenged. While the state is still grappling with a budget crunch, one year later the Empire State Games are back. The event draws 7,000 teenaged and adult athletes in 33 sports and resumes in Buffalo from July 21-25. The Long Island contingent is far from finalized. Competition takes place in three age divisions: scholastic (ages 13-17), open (amateurs 18-or-older) and masters (18-and-up, depending on the sport). Tryouts are still being held this month. For a complete list, go to the Empire State Games web site. Rebooting the process of building a contingent of athletes and coaches who will represent Long Island well at the Empire State Games has been challenging. But another issue has made these Games a tough sell. An ESG in Buffalo has always been a problem for Kenney. It is as far from Long Island as you as you can get and still be in New York. Participants don’t like the travel involved, and it’s challenging for friends and family to follow. So the Long Island region has traditionally struggled to lure the best athletes to a Buffalo-based Games. Then again, it beats another summer without the Empire State Games. And some sports are thriving. Scholastic boys lacrosse has 558 players signed up for 20 roster spots. One team sport was without a coach until May, according to Kenney. Another traditionally strong team has lacked enough registered participants, he said. An added wrinkle was the decision to move from free registration to charging a $10 fee. These Games will be under a microscope because everyone is scrambling for dollars during this recession. Buffalo-area businesses have pledged $1.1 million in cash and in-kind support. And more of the same will be needed to keep the Games as a summer tradition. After all, some have argued that money spent on the Empire State Games might be better served keeping state parks open. When Gov. David Paterson last month closed 60 parks, the state legislature voted days later to keep all state parks, historic sites and campgrounds open with $11 million in emergency funding. The bottom line is Empire State Games are back — for now. So sign up to compete or plan a trip to Buffalo to take in this impressive sports fest. Who knows what the future holds?